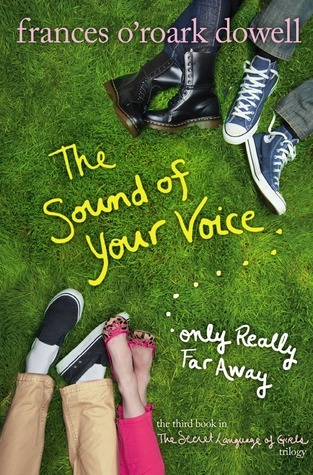 The Sound of Your Voice…Only Really Far Away by Frances O’Roark Dowell. Face Value: I’m getting a little bored with the “shoes and ankles that represent a character’s personality” theme on book covers. This is good enough for this story – the lower legs that we see fit the character descriptions – but Kate and Marylin are far too interesting to be represented solely by their feet. Does it break the slate? This is not an earth-shattering book. The female characters are great, especially Kate. They don’t change the world, but they cause ripples that will make their middle school a better place. I can’t call it a Slatebreaking book, but it is a story with notable female characters and I won’t hesitate to recommend it to young women. Who would we give it to? Any girl who just doesn’t have time for the drama of middle school will appreciate the frank social analysis in O’Roark Dowell’s book. Review: Middle school is the woooooooorst. I have never met anyone who enjoyed middle school. (To be fair, I tend to befriend those who, like me, never sat at the popular kid table, so I’ve got a limited perspective). In The Sound of Your Voice… O’Roark Dowell manages to convey the oppressive social climate of middle school without totally depressing the reader. Kate and Marylin are old friends who are trying to maintain the remnants of their elementary school relationship even though they realize they are going to be in completely different social groups in middle school. They still value their friendship, but it just doesn’t click the way it used to. Marylin is a cheerleader. Kate is a musician. Although they are both smart and socially competent girls, their social spheres are diverging. They used to be able to hang out at the lunch table together easily. Now, when they talk at school, Marylin’s cheerleading pals give her grief. Marylin knows that there are certain things she has to do in order to achieve popularity. Marylin isn’t my favorite character, but she is well-written. She wants that popularity badly, but she also doesn’t want to give up on the easygoing girl she was before. Kate simply doesn’t understand why Marylin wants to fit in with the cheerleaders. The other girls on the team tend to be mean, so why bother? It is this rift in perception of social status that fuels the plot. It’s a common challenge in middle school stories, but O’Roark Dowell keeps it interesting with the great characters she has created. When I tell you that Kate is my favorite character, it should be glaringly obvious what kind of a person I was in middle school. What I like most about Kate is that she is cool-headed. Her peers think she is unflappable, even though some of this dramatic friendship nonsense is making her anxious. I wish I could have been as logical as Kate when dealing with middle school friendships and crushes. Kate’s romantic relationship is so fabulously written. She is really into this 8th grade boy Matthew, and he’s into her too. It would make sense if they could just be together and enjoy the things they have in common and maybe make out a little too. But social codes get in the way. Matthew sometimes acts like he knows Kate, and sometimes he ignores her. Kate gets so frustrated with this back-and-forth that she decides not to play the game. Even though she would love to get the guy, she decides that her wellbeing is more important than having a boyfriend. Kate’s reaction to middle school romantic drama is so admirable, so perfect, and so inspirational that I almost cried while reading it. If you need one reason to read this book, this is it: read it for the best fictional middle school crush I’ve found in middle grade fiction. This entry was posted in Middle Grade, Reviews and tagged cheerleaders, crushes, Friendship, middle school. Bookmark the permalink.